Students who are enrolled in a public high school or a private school, or who have registered as a home education student, may be eligible for Career Dual Enrollment (CDE). Interested students and parents/guardians should read the Career Dual Enrollment Application thoroughly. Please follow the steps outlined on page three of the application within the noted application period on page two. The Assessment Center for TABE and any additional testing requirements is located on the Main Campus in Eustis. Click here for current testing information or call Admissions, 352.589.2250. Students and appropriate school officials will be notified of the student’s acceptance into a CDE program after the application window closes so appropriate adjustments can be made to the student’s high school schedule, if needed. 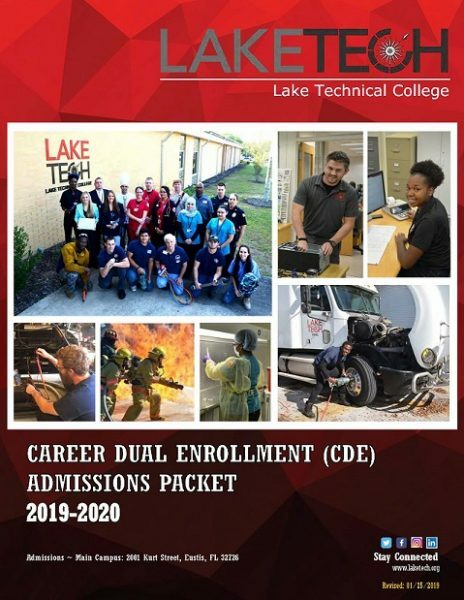 Once accepted, students must come to Lake Technical College to complete the registration process. For more information on CDE, please call Kim Frazier at 352.589.2250, Ext. 1835.